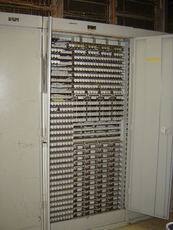 Information on other vintage electro-mechanical telephone switching of note. An all-relay central office is somewhat of a hybrid of a step-by-step and a crossbar office that used mechanical relays instead of crossbars or mechanical wipers. These switches only used for very small central offices. One company of note who made all-relay central office switches was North Electric of Gallion, Ohio (again, not to be confused with Northern Electric of Canada). The CX-100 and CX-1000 (100 and 1000 subscribers respectively) models were used in a limited degree in the public network.